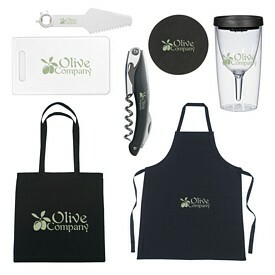 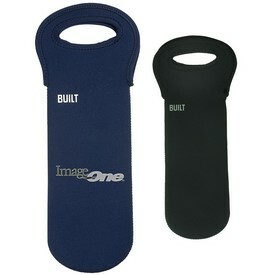 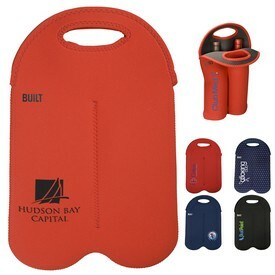 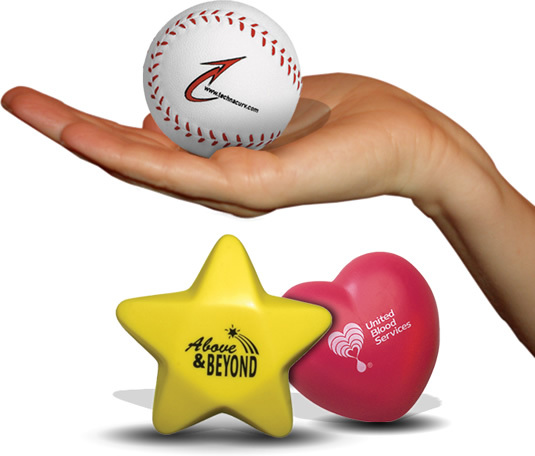 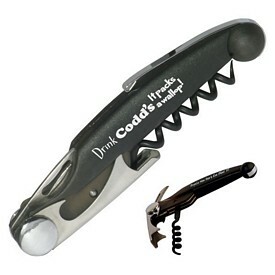 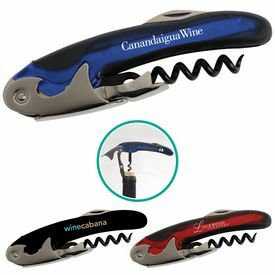 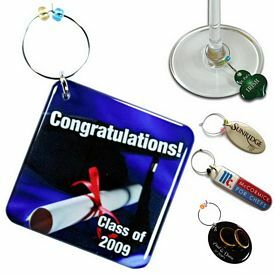 Promotional wine accessories are a great gift idea to help promote your brand. 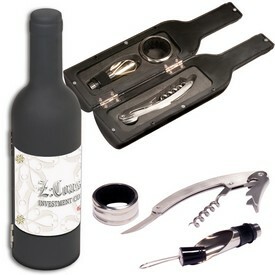 We have a wide assortment of custom wine accessories. 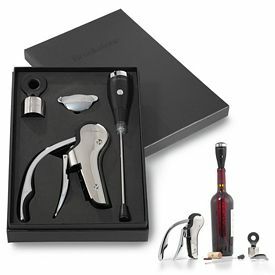 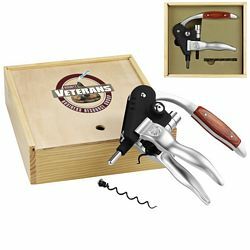 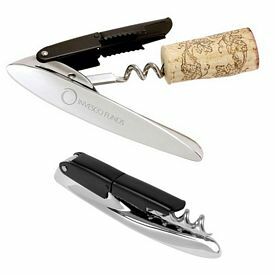 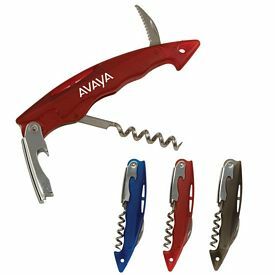 The Promotional Essentials Vinola Corkscrew Set comes with wine Corkscrew, bottle stopper, funnel and lead cutter. 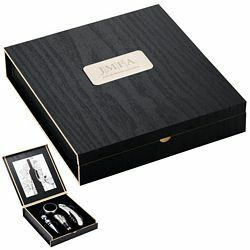 All the items come packed nicely in a hinged customized black wooden box. 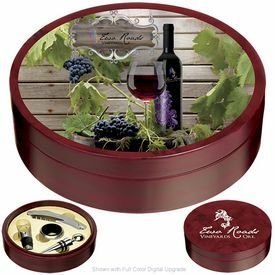 This custom accessory set for wine comes with a free 24 hour rush production service. 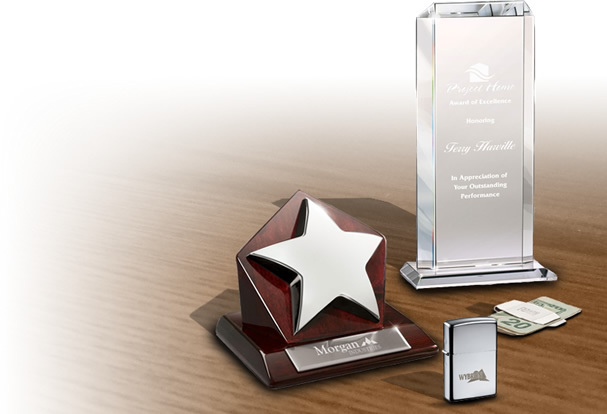 These classy custom accessory sets are available in chrome color, and Laser engraving is done for the company logo. 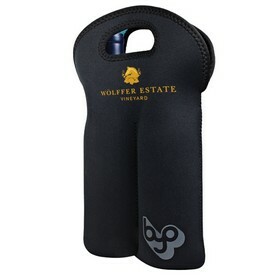 Another extremely stylish product is the customized Napa Wine Case. 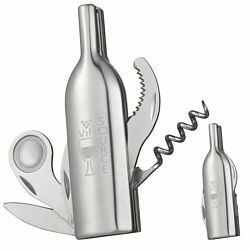 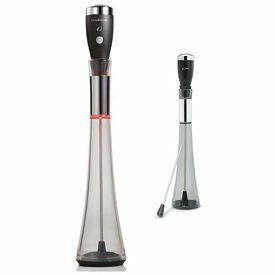 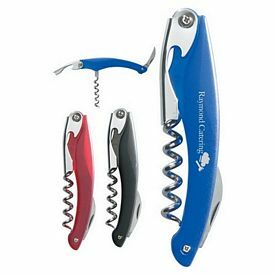 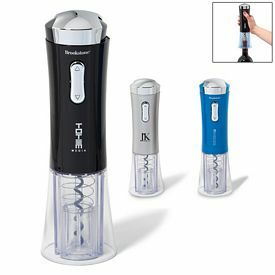 The promotional wine set comes with a stainless steel stopper and corkscrew opener / bottle opener with foil seal cutter located in the lid. 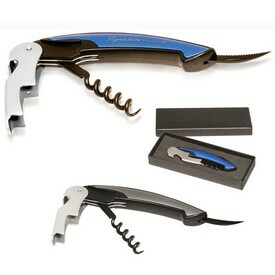 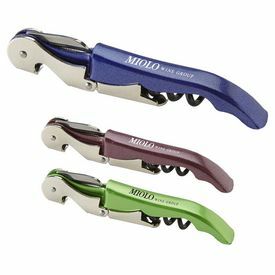 The customized wine corkscrew opener has a free 24 hour rush production service. 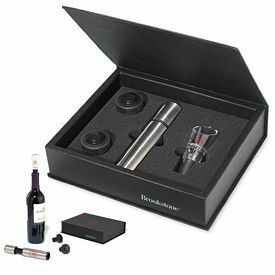 The logoed Bar Gift Set wine has a silver finish. 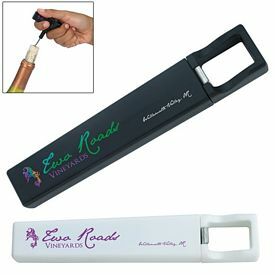 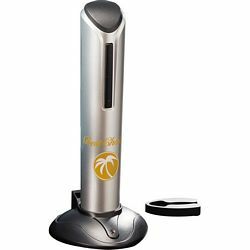 Many of our promotional wine accessories come with laser engraving. 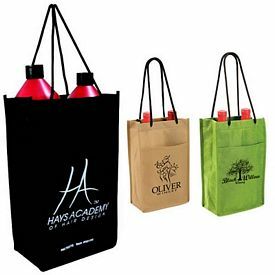 The promotional Non-Woven Single Wine Bottle Bag made of 90 gsm Non-Woven Polypropylene Material has an 18" long and 5mm braided nylon rope straps with a cardboard reinforced top. 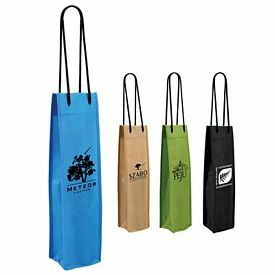 The custom wine bottle bags come in multiple color options. 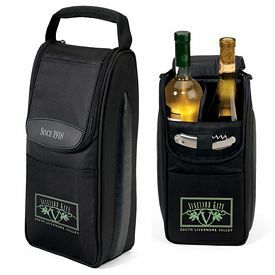 Another elegant product is the promo Belgio Insulated Double Wine Tote Bag with an exclusive design. 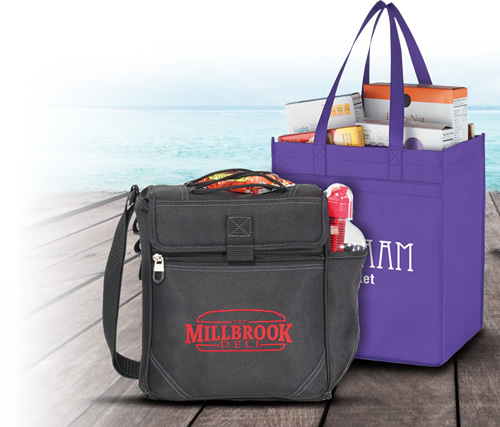 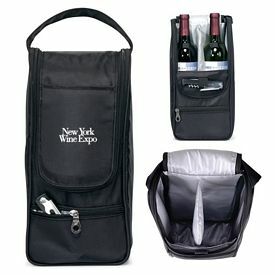 This fully insulated promotional tote bag makes sure that the two bottles of wine it holds are kept cool. 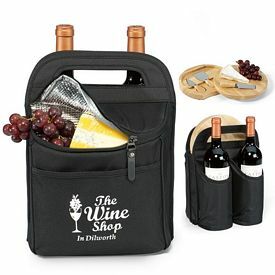 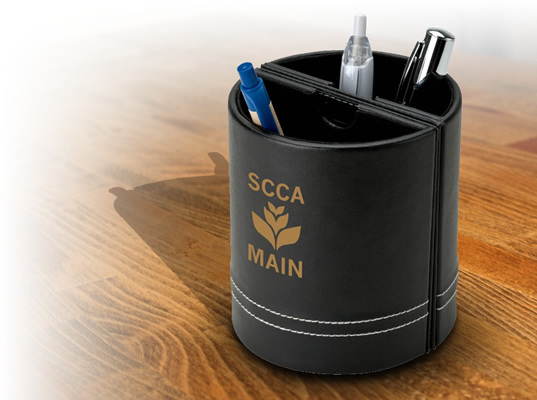 The promotional wine set has a deep front pocket designated for additional storage and comes with a 24 hour rush production service. 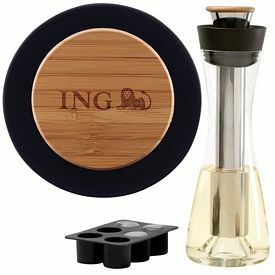 A unique and exquisite option is our logoed Belgio 2-Piece Wine Ensemble. 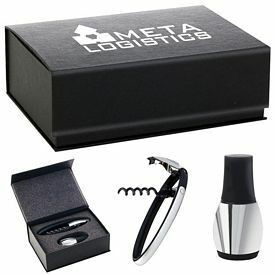 The promotional 2 piece set includes stainless steel waiter corkscrew and classic bottle stopper with rubber grip presented in a contemporary wooden storage box specially designed to fulfill your advertising purposes. 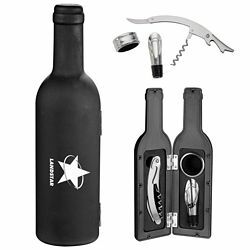 The branded Grigio 4-Piece Wine Sets include spray rubber wine bottle case, waiter corkscrew, pourer/stopper combination and drip ring. 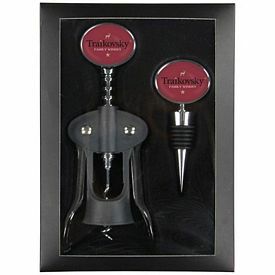 These custom wine sets are FDA compliant. 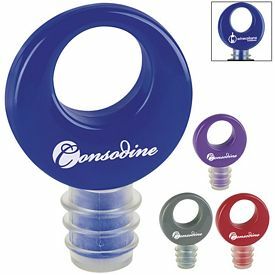 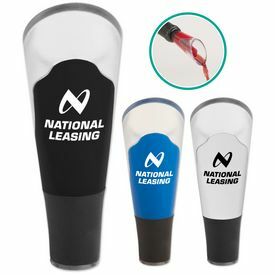 Use these promo wine accessories to help market your company. 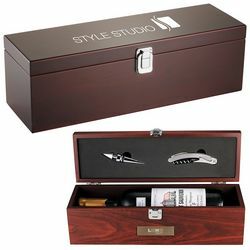 The custom Laguiole Wine and Keepsake Box is one of our popular customized wine accessories with wine and keepsake box. 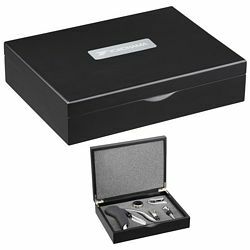 The personalized keepsake box includes bottle stopper and waiter corkscrew opener. 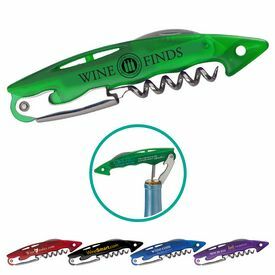 The promotional wine set is accented with carrying handles and subtle brand detailing that will allow your logo or message to take center stage. 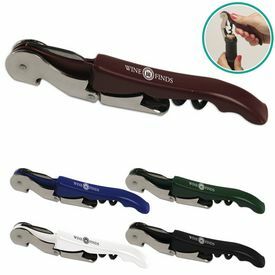 The logo wine sets are screen printed and the company logo is centered between the straps. 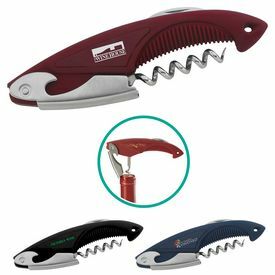 Another great customized product is the Essentials Bosco Steel & Wood Bar Tool which has multiple tools like corkscrew, knife / foil cutter and a bottle opener. 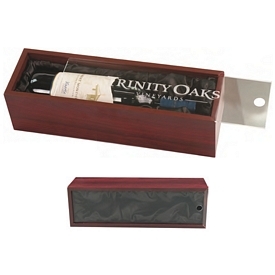 A rich wood inlaid handles makes this logo wine accessory durable. 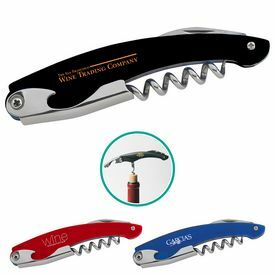 The promotional Vineyard Twin Bottle Stoppers are corkscrew wine openers made of sturdy stainless steel. 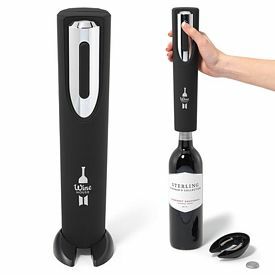 The corked middle keeps the stopper in its place. 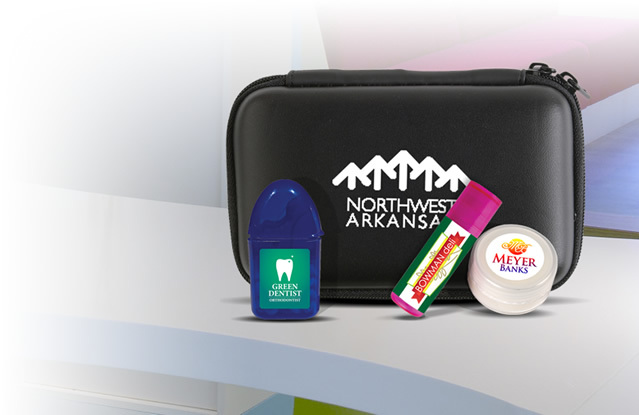 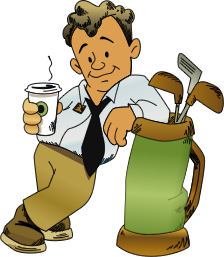 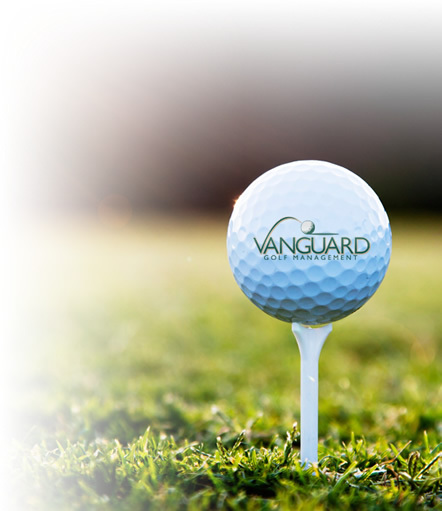 Our services include a free one color logo imprint, free artwork eproof and free 24 hour rush production service.